In Her Darkest Nightmare by Brenda Novak, the remote Alaska setting is perfect for this intense and frightening read! Evelyn Talbot has a very interesting career. With a past that drives her, she studies psychopaths. The most dangerous offenders in a maximum security prison called Hanover House in Alaska. Her career is her life, and a brief relationship with Sergeant Amarok earlier was over before it really started. Their career's collided, their beliefs separate them. But as winter storms approach, so does danger...and murder. Amarok is convinced the recent murders are tied to Hanover House, but Evelyn thinks they are a lot more personal and directed at her. Soon the two of them are spending a lot of time together, and through conflict, tension, fear, insecurity and hope, they become closer...but can a killer be stopped before Evelyn's world falls apart again? Her Darkest Nightmare is a riveting, scary, suspenseful read with a touch of romance and relationship angst. I liked the mix of the two in Her Darkest Nightmare, how the relationship and the suspense tie together, how they are both so uncertain. In many ways Evelyn has overcome her past, but in other ways it still holds her back from her future, especially any personal relationships. Despite her attraction to Amarok, she resists. Amarok is so obviously interested in Evelyn, even if he wishes she'd never come to his town. That way he'd never know what he couldn't have. The push and pull between Evelyn and Amarok is believable in their situation, although some parts of Evelyn's resistance are a bit too angsty in my opinion for a character of her maturity and experience. 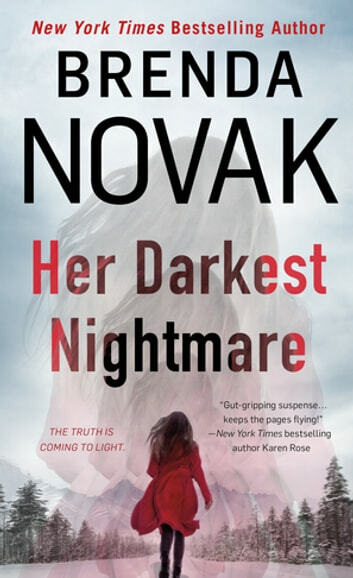 There are a lot of twists and turns in this well researched plot, and Brenda Novak kept me guessing. The pace was great and I was easily absorbed in this world. I'd recommend Her Darkest Nightmare to readers who like thrilling romantic suspense. Dr. Talbot is in the "House"
I was hesitant to start this series but I am loving it so far. Dr. Evelyn Talbot is so passionate about her work and wants to make a difference. Just bought Hello Again and can't wait to start. Nonstop till the wee hours of the morning. Nail biting page turning book. The suspense keeps you trying to figure out what will happen next.